Laurie Monroe MSW, LCSW, has been working with women and families for over a decade. She holds a Bachelor’s Degree in Anthropology from Humboldt State University, a Master’s of Social Work with an emphasis in Child and Family Services from Sacramento State University, and is a Licensed Clinical Social Worker. 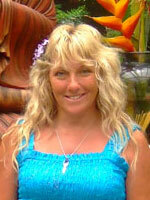 Laurie is a psychotherapist in private practice in Eureka, California. Her theoretical orientation is eclectic, holistic, feminist, solution-focused, strength-based and centered on the family therapy model. Laurie believes that her role as a therapist is to assist others to increase awareness of their own power to heal, sustain, and grow in response to life challenges. Areas of specialty include: sexual abuse/assault, child abuse/neglect, domestic violence, grief and loss, divorce, PTSD, anxiety, depression, and alcohol/chemical dependency. Besides her personal experiences as a survivor of sexual assault and domestic violence, Laurie’s employment history includes: 7 years at the Humboldt County CWS Children’s Shelter, 7 years at Catholic Charities Counseling Agency, 2 years at CASA (Court Appointed Special Advocates) of Humboldt, 2 years at Redwood Coast Regional Center (working with people who have Developmental Disabilities), and 2 years at Humboldt Women for Shelter (now Humboldt Domestic Violence Services). It has been her personal experience and professional observation that the need for inner healing is often of critical importance in maintaining sobriety, health, and happiness.